So what exactly is Comfort Food? In my search for a clear definition of Comfort Food I can say that I am yet to come across any place which explains to me what exactly comfort food is. I can see some of you rolling your eyes and saying why she has to make everything look so complicated. Doesn’t she know the simplest definition of comfort food, a food that provides comfort when eating? But wait, don’t you agree with me that the definition of ‘Comfort’ is quite vague. It’s not necessary that what provides comfort for one may make other person shriek in horror. When I say Egg Plant/Brinjal Sambar is my comfort food, I can see Krish running a mile away from it. We have to look beyond the word ‘comfort’ itself in order to get a better definition. "Food that is simply prepared and associated with a sense of home or contentment or food that is simply prepared and gives a sense of wellbeing; typically food with a high sugar or carbohydrate content that is associated with childhood or with home cooking." "Any food eaten not only for its pleasing taste but also for a sense of contentment, nostalgia, etc. that it provides." Take quick look at the list of comfort foods listed in Wiki, About.com. Most of the things listed don’t fall into my category of comfort food. So is comfort food is based on regional, ethnicity? Or is it defined by it being entrée, main dish or dessert or anywhere else it might sit on a menu card? If someone says that they eat junk food on daily basis, first thing which might cross my head is what an uneducated palate that person has. But if the same person is to tell me that junk food is his/her comfort food, will that make me think twice and make me perceive him/her in any other way? Yes, I think it will on some level. Comfort food for me is food I qualify as something worthwhile and is a food I enjoy. It is something which I wouldn’t find in any star restaurant’s menu. When I am sick, or tired, or far from home I yearn for the gastronomic equivalent of warmth I get from my loved ones. It may be a warm sweater, a kiss on the forehead, a favourite blanket or a food that reminds me of home. My comfort food changes depending on climate, occasion and whom I am with. It’s cold Salad with chilled Yogurt and Ice Cream in summer, a piping hot bowl of Soup or Dal with Rice in winter. A bowl of Rasam is what I crave for when I miss my Amma and a fattening double cheese Veg Deli is what I need when hungry me cross MacDonald’s. White Rice with Curd and Pickle is all I need when I am alone at home and its 3 course meal which comforts me when I am with my family. Comfort food makes me feel good because it reminds me of my childhood, of my mother, of good times and good friends and it gives me a warm, fuzzy feeling. Cook toor dal in pressure cooker in enough water for about 15 minutes till the dal is cooked and mushy. Soak tamarind pulp in about 1 cup of warm water for 5 minutes and squeeze the juice and discard the pulp. Mean while, trim the ends of okra and cut them into 1 inch pieces. Heat oil in a pan and sauté it continuously at medium-high flame for about 8-10 minutes till okra turns crisp and brown. Keep this aside. Heat ½ tbsp of oil in a pan and add mustard, broken red chilli, jeera, curry leaves and hing in that order and sauté. Once the mustard starts to pop and splutter, add finely chopped garlic and sauté it for about 30 seconds. Then add finely chopped onion, slit green chillies and sauté it for around 1-2 minutes till onions turn translucent. Mix in lightly mashed cooked toor dal, squeezed tamarind juice, jaggery, turmeric powder, finely chopped ginger and tomatoes and about 1-2 cups of water if needed. Bring it to boil in a medium flame and mix in salt to taste and fried okras. Cook over a medium flame for around 5-10 minutes till all the flavors blend well and serve hot garnished with finely chopped coriander leaves. 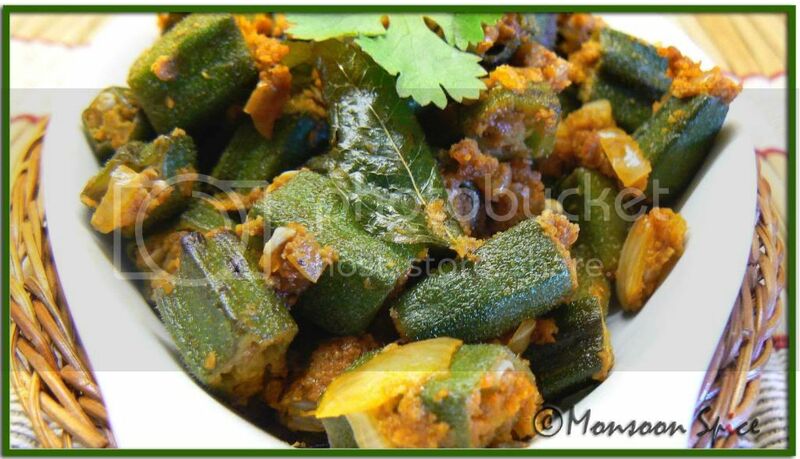 Another favourite way of cooking Okra is simple Fried Okra Palya. Tender fried okra is spiced with ground paste of sweet coconut and spicy sambar powder and crisp onions. The dash of lime juice adds the tanginess and creates a wonderful fusion of sweet, tangy and spicy dish. Heat oil in a pan and add cumin seeds and curry leaves. Sauté it till jeera starts to sizzle and mix finely chopped onions and green chillies. Sauté it till onion turns light brown and add cut okra pieces. Fry these okra for about 7-10 minutes over medium-high flame till it is crisp and brown. Now mix in ground paste and keep stirring for about five minutes on medium flame. Make sure that the paste doesn’t stick to the bottom of the pan. Switch off the pan and mix lime juice and mix well. Serve hot garnished with coriander leaves with rice or roties. Amazing dishes dear, I love ladiesfinger fry and your looks so delicious!! I love simple n easy recipes and yours definitely are!! I think the definition of'comfort food', depends on individual tastes and cravings and of course, no two persons are alike...for me too, it is something which reminds me of home and is soothing at the same time...usually not anything fancy. We don't make dal with okra, unless you count sambar. I have seen another recipe for okra dal here on the blogs, though! Btw, how did you post come to be published on 18th Nov, Sunday in FBD? 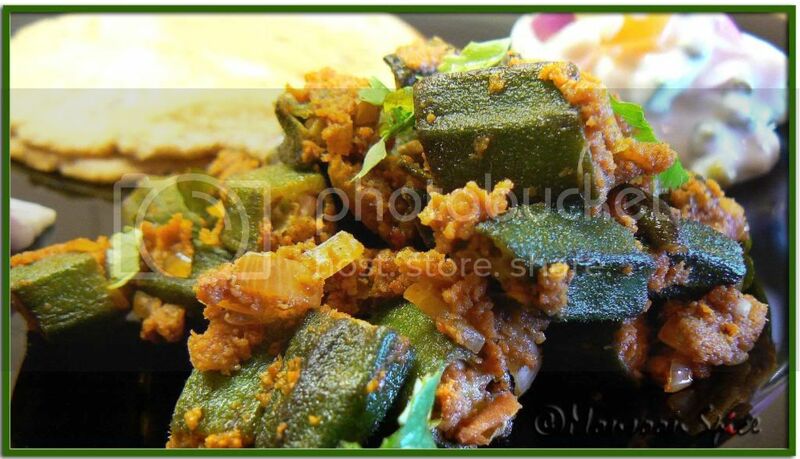 Give me okra any time, love them Sweet ‘n Spicy Fried Okra Palya looks and I am sure tastes awesome. Dal is Comfort food indeed and with okra even better. Have a great weekend. I have Date bars for you at Aroma for Sunday breakfast! Yum...That's really a perfect comfort food. It's so cold today and I'm curling up in my couch hungry but not wanting to cook. Wish I had a plate of rice and this okra dal to go with it. The palya looks even more tempting. Will try out the palya soon. Thanks sia for posting this. Atleast the sight of it made me feel good. Yeah i do agree comfort food varies.... i am also like you when my hubby is not home and i am alone then it is just the simple rice and pickles for me, unless if my daughter is there for lunch. She looks to my plate with disgust :-) when i eat rice , dal and pickles. SHe is like how can you eat something like that and i tell her don't critisie if you are not tasting it..........but she never taste it. Love the dal you can give it to me anytime. The fried okra is too good. I liked the second one better...feel it gives more kick to the veggie....will try next time i get the okra which btw happens very rarely :P and the dal and okra combo is also very new to me...! Okra is one of the tastiest vegetables. I wonder why people frown at its sliminess. BTW, I have never seen okra in dal. Your pics looks so yummy. Never tried Okra and dal though. Okra sabji looks gr8. Lovely recipes, Sups! Its a beautiful ode to comfort food and okra! daal-chawal is my comfort food too, as is sabzi-roti :). You have got both! Jolada roti and palya really looks inviting and is making me hungry (is there anything new, hmm) :-D.
Comfort food, i want some for me, right now :). 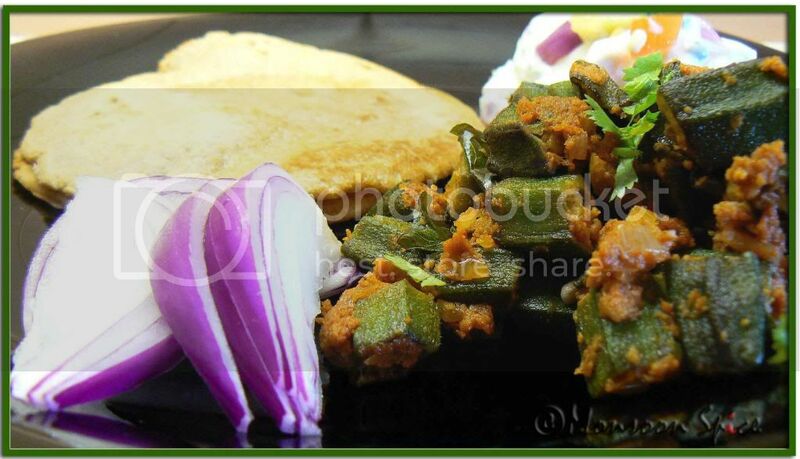 the pics look fab as usual sia :) and i will be trying the palya soon..i have quite a lot of okra in the ref..and since i don't eat these slimy guys..i tend to look for yummy recipes for my husband..the palya looks great..
but your okra sure looks inviting! 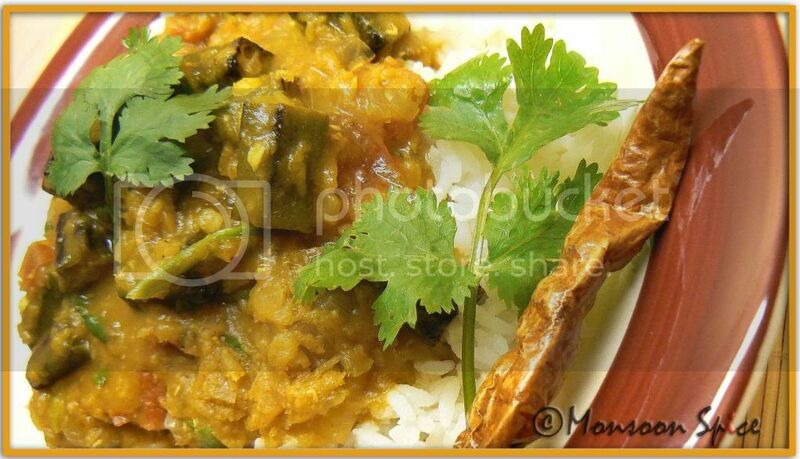 Oh, Supriya, can I come over for a bowl of that YUMMY okra dal... I don't even need the rice -- just a spoon dear :) Looks just beautiful and perfect for a cold night. Thank you for this great recipe for JFI Toor! for me comfort food is made by someone else, and the dishes are also done by someone else. if i comes with a maragrita, even better. Actually I Like Sambhar. Though I have never grown up eating it, I now sometimes have craving for it !!! My Bong friends think I am mad. But then just like Red Masoor Dal gives me comfort on some days Sambhar does too. Yes, the mercury is dropping and I need some comfort food! I'll take the fried dal! I see that famous jolada roti makes an appearance again! I think I am just going to fast till I reach mumbai! Both the dishes look nice. I liked the recipe for okra dal. I only recently discovered the of okra in sambar and love it! 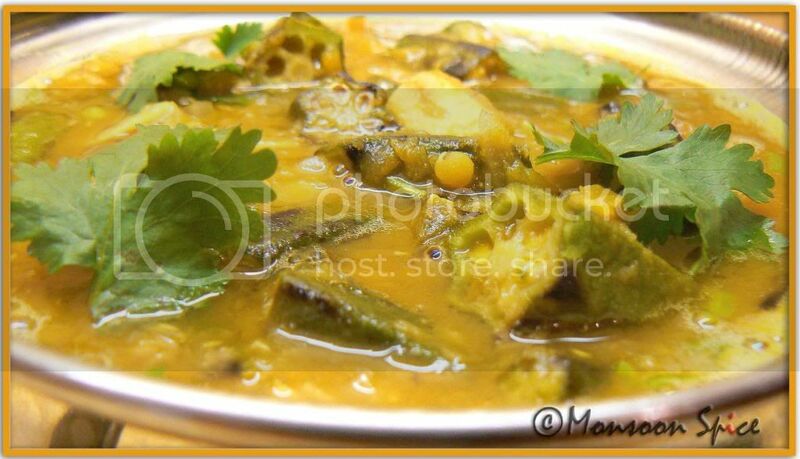 This okra dal sounds like a must-try, especially with the masoor dal. Truly the ultimate comfort food. lovely comfort food sia.. that too wth okra means it is always fab.. I have to try this one when I get a chance. Never tried fried okra dal before...usually have just the slightly fried version but like the new (for me) dal version! Thanks! I am always so amazed by your food design, no matter what you cook, it always comes out fabulous. I love ur sweet & spicy okra.They look great. i dont know many dry recipes with okra only because i never used to like them until recently. Now i dont know what came to me I love and always is in look out for new recipes. Dal with Okra....hmmmmm something new for me. We make sambar, rasam and kadhi with okra other than curry. curry looks nice and delicious. wow sia yenu bendekai galore agoidu :) all the recipes looks yum! Thank u:) everytime when we r on long trip on roads we too crave for simple dal/rasam rice. Thank u padma. I hope u try these as they r quite easy as well required very few ingredients. Sambar is different. Actually dal with okra is my own creation;) I wanted to add some veggie to simple dal and thought okra will work good. Thankfully it turned out lip smackingingly delicious. What? U don’t get fresh okras? Well, it works with frozen ones too. I fry them in high flame so that all the moisture is absorbed and it turns crisp. But yeah, nothing can beat fresh ones isn’t it? Thank u kribha. Even here the temperature is going south. It snowed in some part of UK already. Do let me know how u like it when u try that palya. Its my fav one. Thanks lav:) it was an experiment to put together okra and dal and it worked for me:) hope u give it a try sometime. Hey, no one will mind if u r not able to comment. Ur academic work and family comes first. Blogging comes later. Concentrate on ur work now not on u not able to comment for few weeks. We all know what is more imp girl. So don’t u worry… good luck for ur work. Thanks rina. May be u should give it a try sometime. They both taste wonderful. What? U r not very fond of okra? OMG! I do hope u know what u r missing;) he he he… do let me know when u make it for ur hubby and how he likes it. I am a big fan of OKRA and the picture that you have posted looks perfect and delicious. I am drooling. Such a wonderful healthy dish on a cloudy moody day. I totally agree with you sia! oh poor u... but hey, some of my friends dont even get frozen okra. u can also use frozen okra for these. just fry them in littl eoil at high flame. it will work fine as i have done it quite many times. hope u give it a try dhivya. 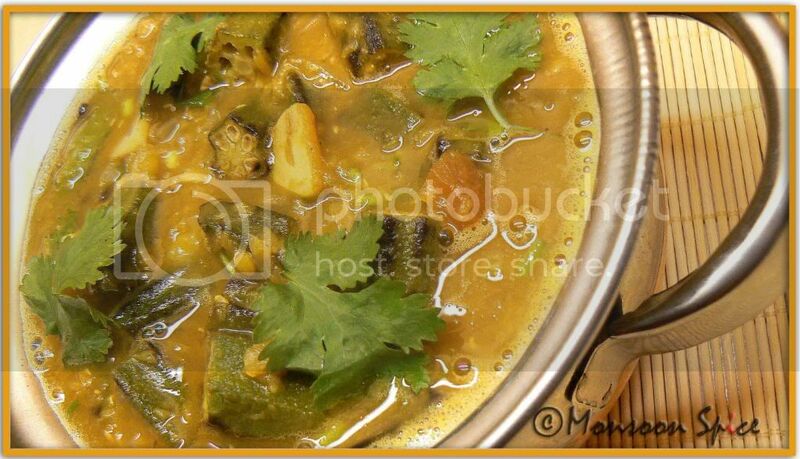 okra sambar is very common dish in mangalore where it is cooked in plain dal or in coconut base which we call kodhel. this time i tried adding fried okra to basic dal and it tasted really good. addition of tamarind and jaggery gave it nice sweet and sour taste. i didn't use any sambar powder as i would have used for okra sambar. i didn't wanted the dal to be little spicy, sour and sweet and i am happy that my experiemnt was successful this time;) try that palya. its our fav one at home. true, comfort food is related to ur childhood memories, the food cooked by ur mom or loved ones and the one which u still remember enjoying it. i was not a big okra fan while growing up but now i appreciate and love each and every veg for its uniqueness. this recipe is my experiment gone right;) hope u give it a try. rasam with okra? now that caught my attention. do u have the recipe posted in ur blog? idu bendekai sambar all kanri. idu bedekai dal. i have not used any sambar powder or masala. LOL... bendekai sikkiyappaga madiddu:) 2 ottinge post madide ashte. Sia, these are wonderful recipes. My mom once told me about okra dal. I never tried it as I was skeptical. After seeing these photographs, I must try these. do try it vani. it was one of my experiments gone right;) hope u enjoy it as much as we did. stumbled here while looking for something different to cook. Loved the way you photograph the dishes and way they look so perfect.